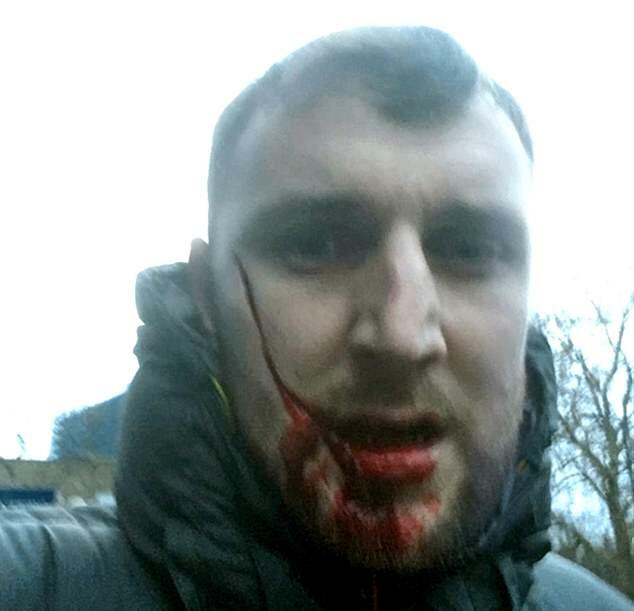 A football fan has shared a picture of the horrendous scar he was left with after he was slashed across the face during a brawl between Millwall and Everton fans. 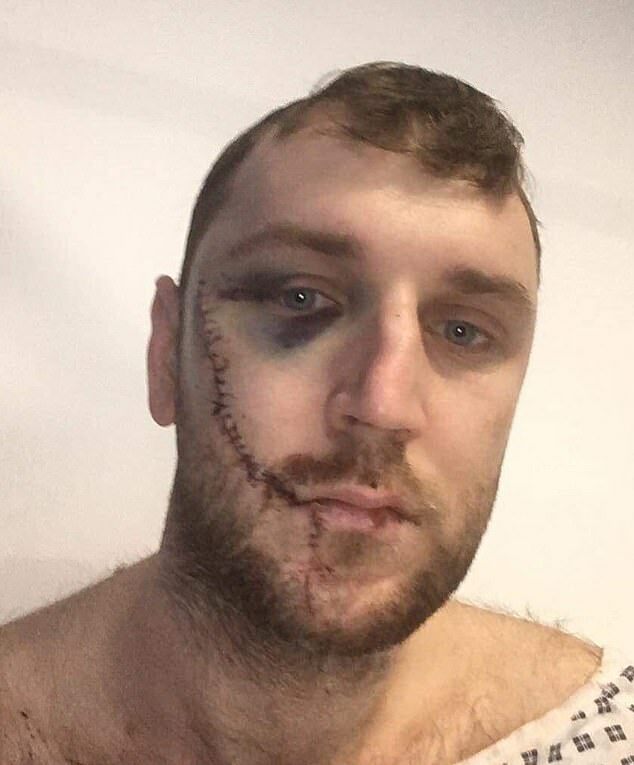 Everton supporter Jay Burns said he was ‘absolutely devastated’ and ‘can’t even look at myself in the mirror’ after he was injured by a blade and left with more than 20 stitches after the fight ahead of yesterday’s FA Cup match. 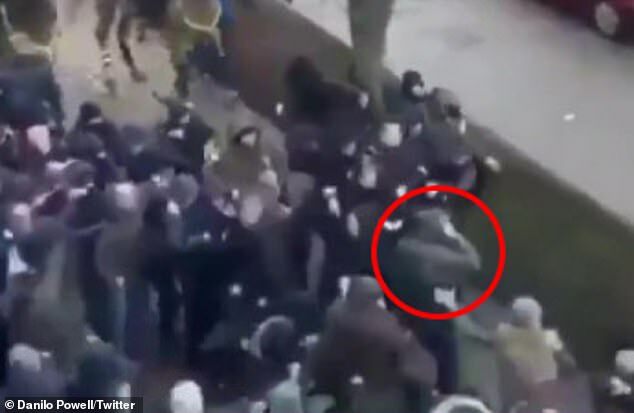 Footage of the brawl shows another man seemingly swing a weapon at the fan who then backs up and clutches his face before falling at the feet of the crowd. 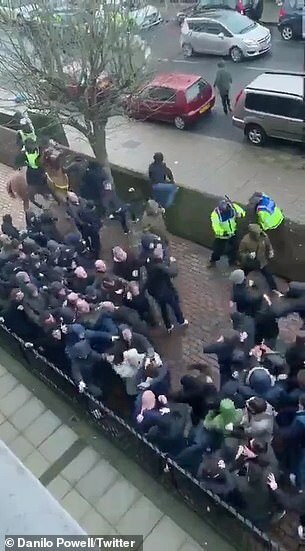 The violent scenes erupted outside Surrey Quays station in south-east London as the two sets of fans engaged in a huge punch-up before making their way to Millwall’s stadium, where the London side pulled off a shock win. Sharing a picture of the stitches on his five-inch scar, the fan wrote: ‘Absolutely devastated about my face. ‘Nice one to all the Everton lads and everyone who has messaged me and the Liverpool lads who have messaged me, much appreciated. 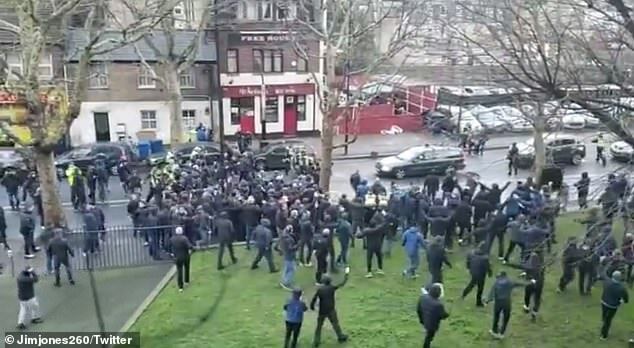 The travelling support were confronted as they arrived and a large group of match-goers fought by Southwark Park in the build-up to kick off. 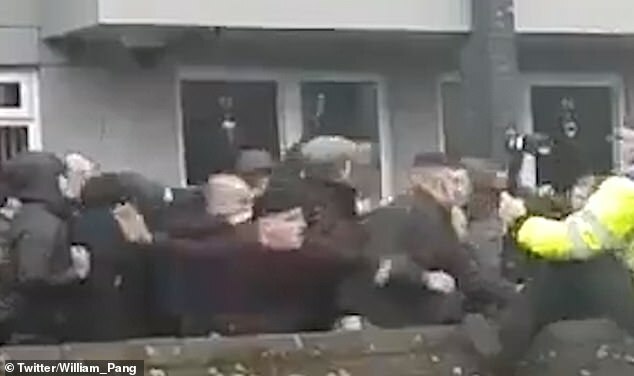 The two sets of supporters swung a flurry of punches at each other as the hectic scene was recorded by police with GoPro cameras. 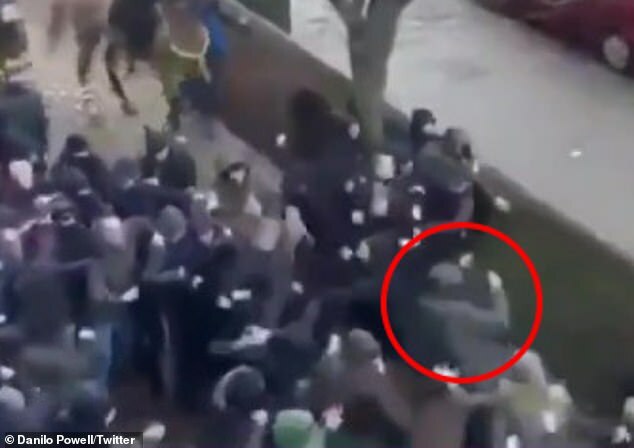 Police officers on horses eventually managed to break up the brawl by using batons as one man walked away with a nasty gash down the side of his face. 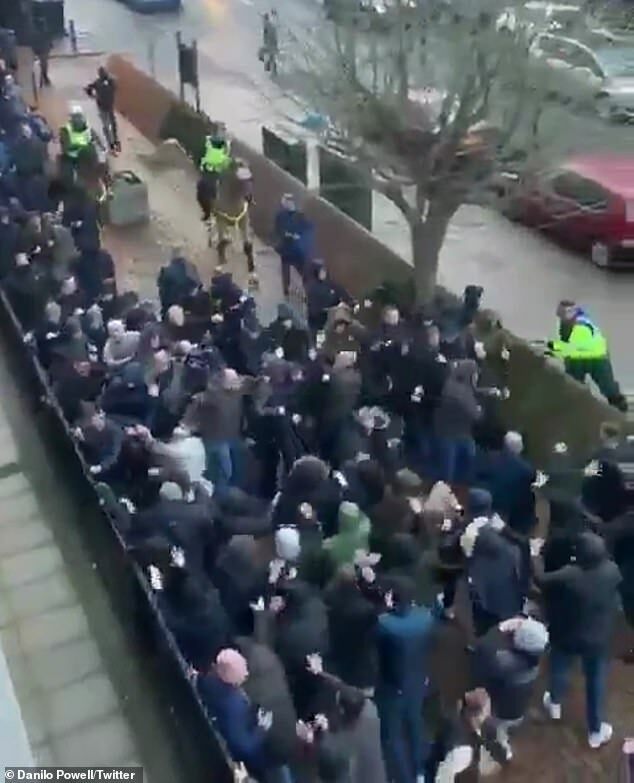 Following the fights, a police spokesperson confirmed that the knife injury sustained by one supporter was not thought to be life-threatening. 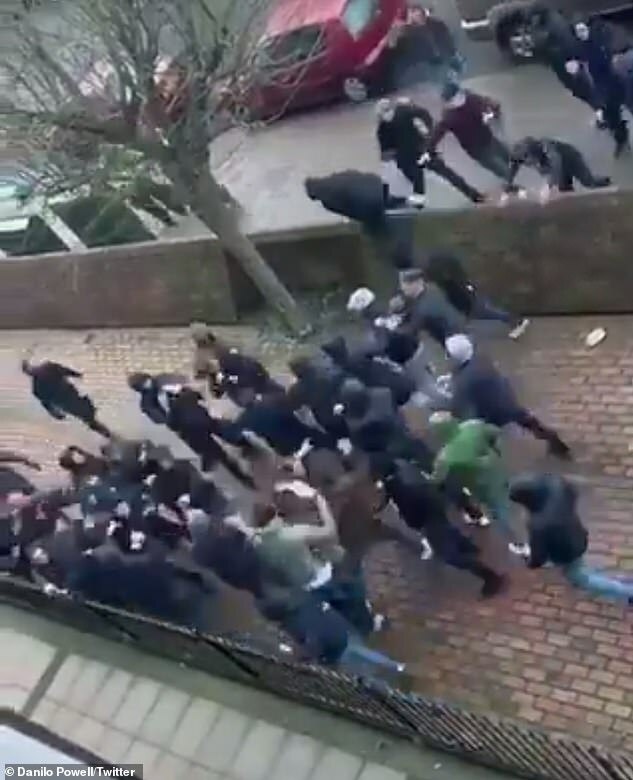 The Metropolitan Police released a statement on the incident that read: ‘At around 16:42hrs officers became aware of a large group of males fighting in the Hawkstone Road area. ‘One male aged in his 20s was discovered suffering from a slash wound to the face. He was taken by LAS to a south London hospital. His injuries are not life-threatening. 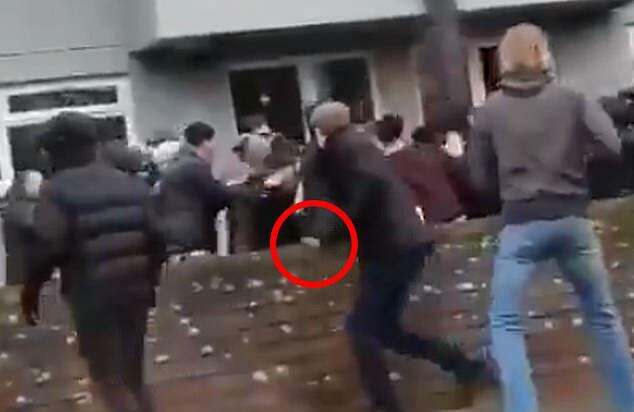 Detective Inspector Darren Young, of the South Central Command Unit, added: ‘The behaviour of those involved in this incident is nothing short of disgraceful and those involved can be certain we will be working to identify them. 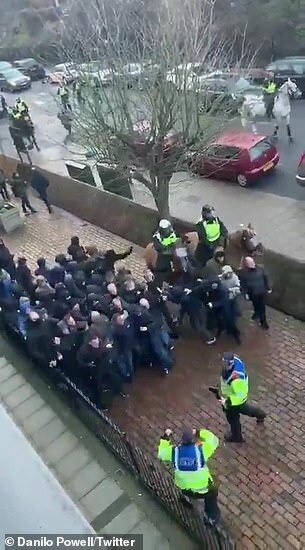 More fights broke out in the surrounding areas of Millwall’s ground, as big groups of Toffee fans chanted songs while walking past a pub full of Lions supporters. 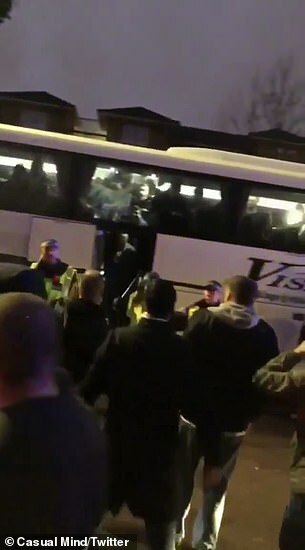 Glasses, chairs and other objects were hurled from the pub’s beer garden as the large group of Everton fans stood on the other side of the road. 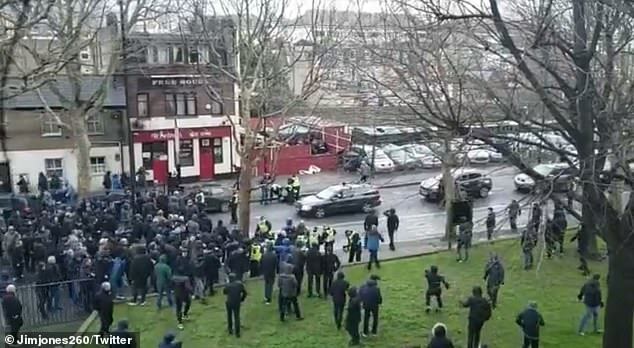 Missiles were thrown back at the pub’s garden as cars slowly drove by due to the large number of fans occupying the road. 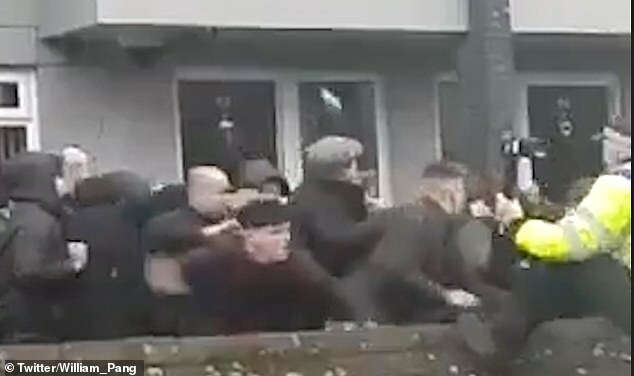 One resident who recorded the clashes described the conflict as ‘too much’ before noticing that nearby cars were getting damaged because of the thrown objects. 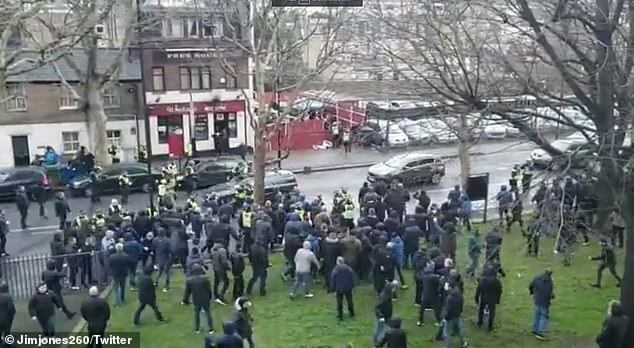 Everton supporters arriving by coach were also confronted by Millwall fans before they made their way to the ground. 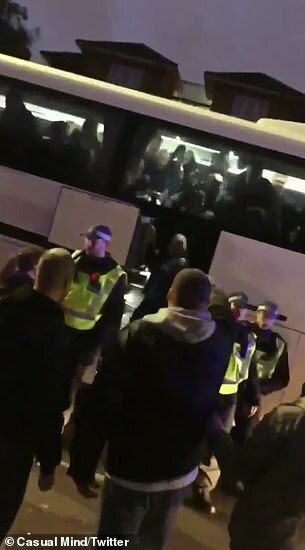 As police guarded the side door of the coach, Lions supporters goaded the travelling fans before a bottle was thrown at one of the bus windows. Chants of ‘Millwall’ were shouted by some before both sets of fans made their way into the Championship ground.